Supporters of Donald Trump differ substantially from other Republican voters in many of their foreign policy attitudes. And these differences extend to their views of immigration and government scrutiny of Muslims in the U.S.
Trump supporters have a distinct approach to global affairs, according to Pew Research Center surveys conducted in March and April. Fully 84% of those who support Trump for the GOP presidential nomination favor building a wall along the U.S.-Mexico border. That compares with 56% of Republican voters who preferred another candidate for the Republican nomination – those who supported Ted Cruz or John Kasich, who last week suspended their presidential campaigns, or volunteered someone else. Trump supporters also are far more negative about the effects of free trade agreements than are non-Trump supporters. Two-thirds of Trump supporters (67%) say free trade agreements have been bad for the country, and 60% say they have definitely or probably hurt their own finances. Among GOP voters who supported other candidates for the party’s nomination, fewer than half (43%) say free trade agreements are bad for the country, while 39% say their own finances have been impacted negatively. And while 65% of Trump supporters view U.S. engagement in the global economy as a bad thing, just half of non-Trump supporters say the same. More generally, 54% of Trump backers say the U.S. does too much in solving world problems, while 29% say it does too little and 12% say it does about the right amount. Among non-Trump supporters, opinion is more mixed, with 40% saying the U.S. does too much globally. 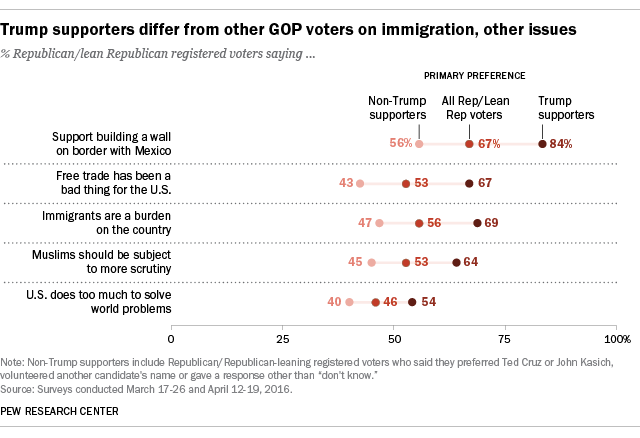 Opinions about immigrants and immigration policy also divide Trump supporters from those who back other GOP candidates. Nearly seven-in-ten Trump supporters (69%) say that immigrants today are a burden on the U.S. because “they take our jobs, housing and health care.” Fewer than half of Republican voters who did not support Trump (47%) say that immigrants are a burden. Trump supporters are divided over whether undocumented immigrants should be allowed to stay in the U.S. if they meet certain requirements; 47% say they should, while 52% disagree. Those who say undocumented immigrants should not be allowed to stay legally in the U.S. were asked if there should be a “national effort to deport” all of those here illegally. Overall, about four-in-ten Trump supporters (42%) support this action. But among non-Trump supporters, a majority (64%) says undocumented immigrants should be allowed to stay in the U.S. legally if they meet certain requirements. Only about a third (34%) of non-Trump supporters oppose providing a path to legal status for those here illegally, and just 25% favor a national effort to deport all undocumented immigrants. 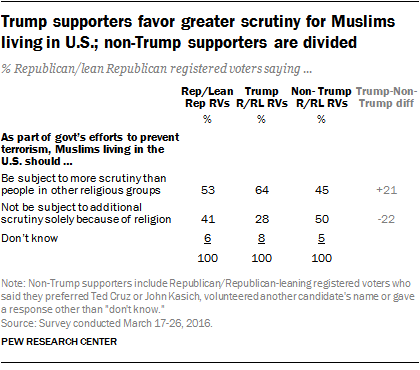 Trump supporters also are more likely than GOP voters who do not support him to favor greater scrutiny for Muslims in the U.S. as part of government anti-terrorism efforts. Nearly two-thirds of Trump supporters (64%) say that Muslims living in the U.S. should be subject to additional scrutiny than people in other religious groups. That compares with about half (45%) of non-Trump supporters. There is broad support of Republican and Republican-leaning registered voters, regardless of which candidate they preferred in the nomination contest, for the U.S. military campaign against the Islamic militant group ISIS. In addition, large majorities of both Trump supporters (70%) and non-Trump supporters (66%) favor the use of U.S. ground forces to fight ISIS. More generally, the predominant view among GOP voters is that using overwhelming military force is the best way to defeat global terrorism. Fully 77% of Trump supporters and 68% of non-Trump supporters favor the use of overwhelming force against global terrorism; just 18% and 25%, respectively, say that relying too much on force creates hatred, leading to more terrorism. And when it comes to views of the conflict between Israel and the Palestinians, identical majorities of Trump supporters and non-Trump supporters say they sympathize more with Israel (77% each). Just 7% of Trump backers and 5% of non-Trump supporters say they sympathize more with the Palestinians.